Over the last five to ten years some very exciting changes have taken place in the City of Wilmington, Delaware to attract new businesses and professionals, as well as improve the quality of life for current residents. There has been notable residential and commercial development along the Wilmington Riverfront and many plans and initiatives are working to improve the livability, landscape, and mobility of the City. These and other components create favorable conditions to make cycling a popular and practical mode of transportation in and around Wilmington. The Wilmington Bicycle Plan is a planning and policy framework to make Wilmington more bicycle-friendly and aligns with the City’s recent agenda for sustainability and addressing global climate change, along with a city-wide health initiative. The Plan was developed in coordination with the City of Wilmington, a steering committee, and the general public. The Plan has sought to lay the groundwork for Wilmington to become a first-class destination for recreational cyclists and bicycle commuters. The Plan introduces a proposed coordinated bicycle network that will connect residents with surrounding neighborhoods, the downtown central business district, and other key destinations. The document puts forth short- and long-term recommendations to enhance mobility and accessibility, remove barriers to bicycling, and promote safety. Recommendations include more bicycle parking and way-finding signage, improved bicycle access to transit options, and considers a city-wide Bike Share program, among many others. After several rounds of public outreach and edits, the Plan was formally presented to Wilmington’s Economic Cluster, the Public Works and Transportation Committee, and later adopted by WILMAPCO’s Council in November 2008, in which the City of Wilmington and DelDOT is represented. Currently, WILMAPCO is actively involved in the Wilmington Bicycle Advisory Committee and is continuing to work with the City’s Public Works Department on implementing short-term recommendations, such as bicycle parking and signage. Sharrow marking on Market St., near 10th St.
Several recommendations from the Wilmington Bicycle Plan have also been incorporated into the 2009 Downtown Wilmington Circulation Study, which seeks to improve transportation efficiency for all modes, including walking and bicycling. June 2013: WBAC is moving forward with a DelDOT Transportation Enhancement grant to implement bike infrastructure improvements. June 2013: WBAC coordinated with the Dept. of Public Works to install ten new locations for bike parking. May 2013: The third annual Bike to Work Day and Wilmington Grand Prix Time Trials Picinc was held. June-September 2012: WBAC hosted its first season of family-friendly bicycle rides. May 2012: WBAC launched phase one of a website. www.bikewilmington.org is operational for public use. WBAC hosted the second annual Bike to Work Day Event with expanded bike commuter group rides. May 2011: Wilmington hosted its first Bike-to-Work Day event, which included a morning ride, bicycle commuter meet and greet, free secure bike parking, and an afternnon barbeque tied with the Wilmington Grand Prix. May 2011: The League of American Bicyclists recognizes Wilmington with an Honorable Mention for its Bicycle-Friendly Community award. 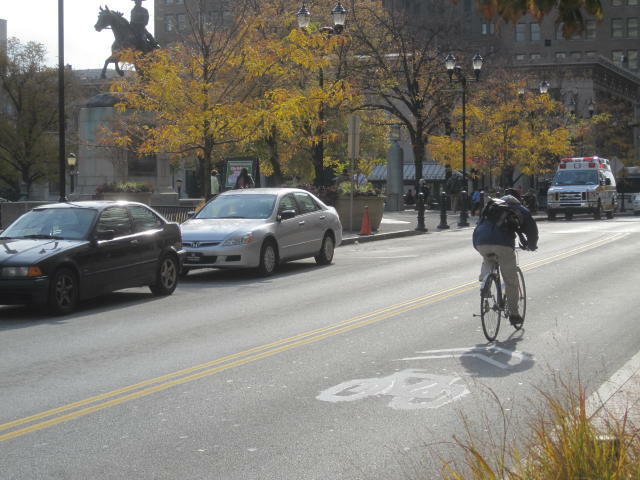 November 2010: Market Street in downtown Wilmington received the City’s first installations of sharrows, which is a marking to indicate a shared roadway. See picture below. September 2010: The Wilmington Bicycle Advisory Committee is preparing to submit an application to receive a Bicycle-Friendly Community designation. May 2010: Additional bicycle route signage has been provided within the downtown area. March 2010: Mayor Baker issued Executive Order 2010-2 which created the Wilmington Bicycle Advisory Committee (WBAC). The WBAC will provide recommendations to the City on matters relating to bicycling and to raise public awareness on bicycling issues. An inaugural meeting was held in April. For more information about the Wilmington Bicycle Plan, please contact Dave Gula at dgula@wilmapco.org. Urban Bike Project of Wilmington, Inc.